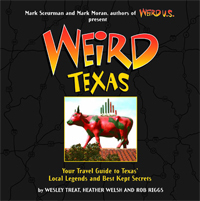 Texas is certainly known for its tall tales, and whenever a small town is lucky enough to be associated with one, the residents will usually do their best to run with it, true or not. After all, publicity means tourists and tourists mean dollars. There is, however, the occasional exception. In the case of Aurora, just north of Fort Worth, locals were long ago blessed with a shot at the easiest dollars of all: nerd dollars. Strangely, they've never grasped the opportunity. The tale in question dates back more than a hundred years to the spring of 1897. In an April 19 story published by The Dallas Times Herald, reporter E.E. Hayden wrote of a strange airship that was seen flying over town early that morning, just before it crashed on the property of Judge J.S. Proctor. The unidentified craft "went to pieces with a terrific explosion," destroying Proctor's windmill and, tragically, his flower garden. At that time, airship sightings were not uncommon. Starting the fall of the previous year, West Coast residents began describing a cigar-shaped craft drifting under cover of darkness across the California skies. The reports continued for months, spreading eastward into other states, including Kansas, Nebraska, Missouri and, of course, Texas. Many accounts surfaced simultaneously from distant locations, suggesting more than one craft. The incident, still unexplained, has become known as the Great Airship Mystery of 1896-97. Hundreds claimed to have seen the vessel, but the most unusual report continued to be that from Aurora. Not only had the airship crashed, but according to Hayden's article, a small, humanoid body was recovered from the wreckage. The being was said to have been disfigured by the accident, but was clearly "not an inhabitant of this world." Those who arrived on the scene subsequently buried the creature in the Aurora Cemetery. 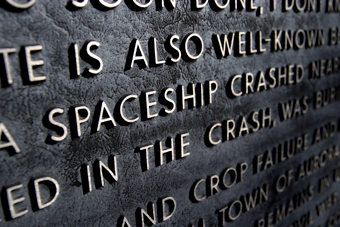 A small grave marker was erected, which was said to have been carved with an image resembling the visitor's spacecraft. Unfortunately, when the story resurfaced in the 1970s, vandals made off with it. Surprisingly, the legend has today simply been brushed aside. Most of the locals appear disinterested in the tale, many openly and fervently refuting it as a hoax. They'll tell you Judge Proctor never even had a windmill and that it's very likely he had cooked the whole thing up with E.E. Hayden, who himself was from Aurora and may have been looking to revive his declining hometown. The widespread airship reports just provided the perfect setting. 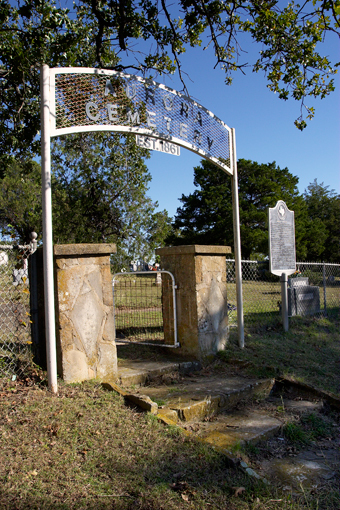 If it weren't for the historical marker outside the cemetery, which briefly mentions the alleged incident, Aurora wouldn't offer any evidence of the event at all. If Aurorans had any entrepreneurial spirit, of course, they'd take a cue from Roswell and make the most of what they were handed. All it would take is a couple of green buildings, a few businesses with "UFO" in the title, maybe an annual parade, and the geeks would line up, every one eager to shell out the cash for all the foam-rubber aliens and little, broken windmills they could carry.